This article is based on an article in the Vauxhall Society’s Newsletter of January 1987. The Effra (from the Celtic yfrid – a torrent) rises in the south near Crystal Palace then flows through Norwood Cemetery, parts of Dulwich, Herne Hill, Brockwell Park, Brixton and Kennington before joining the Thames by Vauxhall Bridge. The River Effra’s history is very much a part of the history of Lambeth. 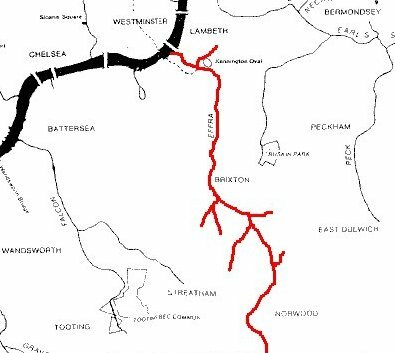 Lower parts of the Effra have been used as sewers since the 17th century but the river was still supplying Dulwich with fresh water in 1860. At one time, the river was navigable for small boats as far up as Brixton – Elizabeth I is reputed to have made the journey by barge when she visited Sir Walter Raleigh at his home there. Even into the early 19th century it survived as an open stream. When the Albert Embankment was built, however, much of the water from the Effra was diverted into a sewer while the river’s remaining flow was enclosed in a covered culvert. In 1985, to overcome problems of damp and occasional flooding in the basements of Dulwich Road, a storm relief sewer was built, running from Burbage Road to Clapham. In very heavy rain, surplus water is now allowed to overflow into this sewer, which runs forty feet below Brixton Water Lane, and later, when the tide is right, it can be released into the Thames.